House Speaker Nancy Pelosi is rejecting the idea of providing "some big down payment" for President Donald Trump's border wall as part of a solution to the partial government shutdown. Pelosi on Thursday spoke after Trump suggested a "reasonable" installment on such a barrier might be a way to solve the impasse. She suggested the idea was not a serious one. She told reporters: "I hope that doesn't mean some big down payment." She said, "That is not a reasonable agreement between the senators." Asked whether she knows the size of a down payment that Trump might find reasonable, Pelosi replied, "I don't know if he knows what he's talking about." 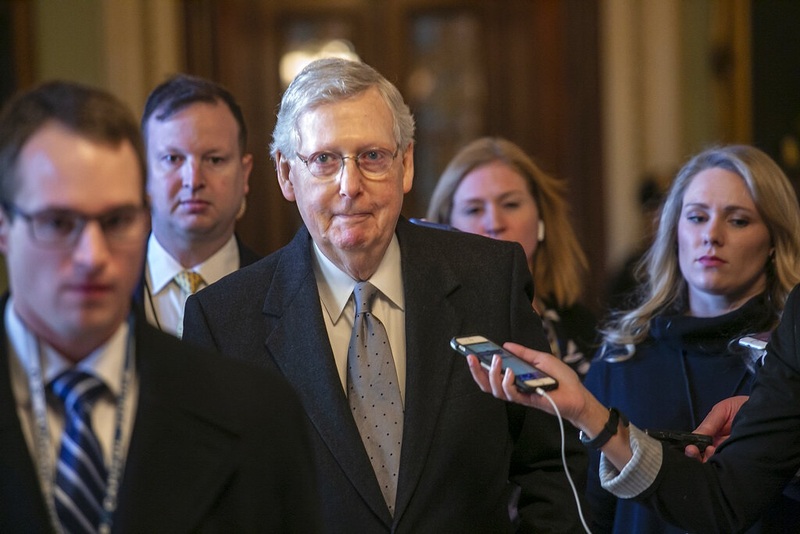 The Senate earlier Thursday rejected dueling Republican and Democratic measures to end the 34-day partial government shutdown. President Donald Trump says he's "just honored" that almost all Senate Republicans voted for his proposal to trade funding for a U.S.-Mexico border wall for temporary protections for some immigrants, even though lawmakers rejected the bill. It was one of two measures designed to end the partial government shutdown that failed in the Senate on Thursday. Democrats sponsored the second bill. Fifty of 53 Senate Republicans voted for the Trump proposal. Speaking at the White House, Trump said, "I just really want to thank the Republicans for holding." He added that he was "just honored that almost all of the Republicans voted for our bill." Trump also praised Sen. Joe Manchin of West Virginia, who was the only Democratic senator who voted for Trump's plan. 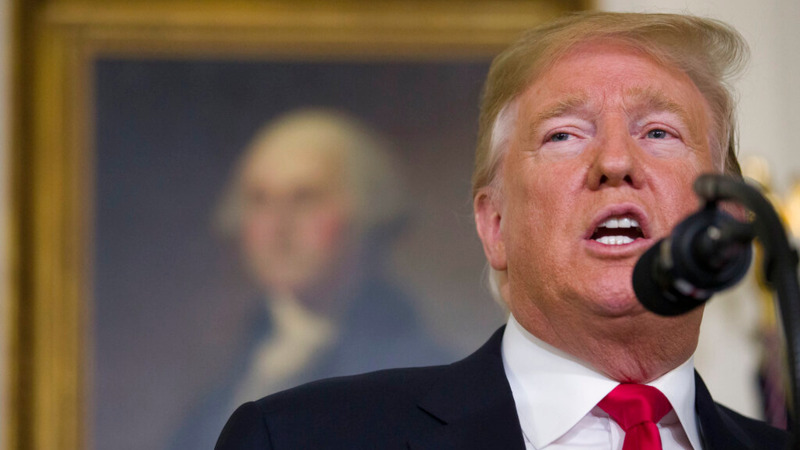 The White House says President Donald Trump will not accept a short-term deal to reopen the government unless it includes "a large down payment" for his promised border wall. The statement from White House spokeswoman Sarah Huckabee Sanders on Thursday came as Senate Republican leader Mitch McConnell and Senate Democratic leader Chuck Schumer were meeting to try to hash out a solution. Earlier Thursday, the Senate rejected competing Democratic and Republican proposals for ending the 34-day partial government shutdown, which is the longest in the nation's history. Sanders says the Senate leaders are trying to see "whether or not they can work out of the deadlock." But she says a three-week continuing resolution "would only work if there is a large down payment on the wall." Both bills went down in defeat. The group, many of them new House members, appeared in the chamber Thursday to provide "solidarity" with senators who voted to end the partial government shutdown. The vote came as 800,000 federal workers faced a second missed paycheck. Democratic Rep. Ilhan Omar of Minnesota said the group had been prepared to chant, "Do the right thing," but Senate officials warned them to remain quiet and behind a railing where staff usually sits. Senate Democrats lined up along the rail to give hugs and say hello. 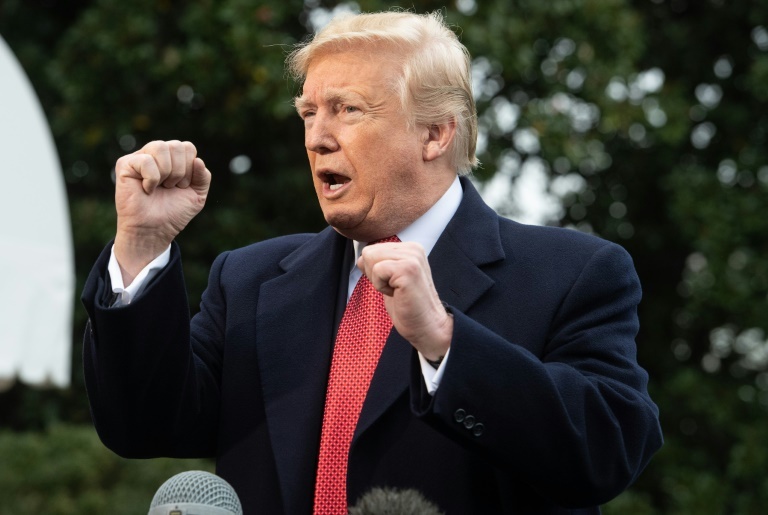 Senate Democrats have blocked President Donald Trump's request for $5.7 billion to construct his long-sought wall along the U.S-Mexico border, as a partial government shutdown continues for a 34th day. Pelosi told reporters she's "still optimistic" Senate Republicans will vote Thursday for the Democratic bill that would temporarily reopen government while talks are held over Trump's demand for $5.7 billion to build the border wall. 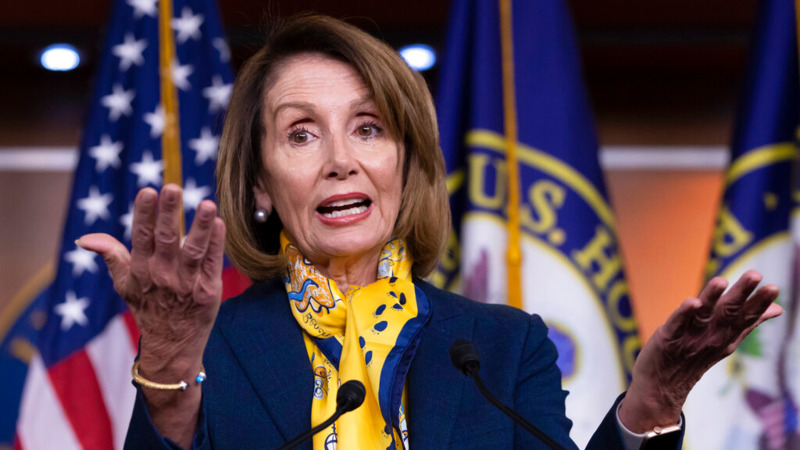 The speaker said House Democrats are putting together a new border security package that could provide a step toward a compromise. It will include money for fencing, technology, personnel and other measures, but not Trump's proposed wall. Trump responded in real time on Twitter saying, "very simply, without a Wall it all doesn't work.... We will not Cave!" The Senate's new approach to ending the partial government shutdown actually takes votes instead of just pointing fingers. But two competing bills appear likely to fail Thursday, caught in a poisonous Washington impasse. Republicans would couple ending the 34-day shutdown with $5.7 billion for President Donald Trump's border wall and revamping immigration laws. Democrats would reopen agency doors for three weeks while bargainers continue to seek a budget deal. Twin defeats might spur the two sides into a more serious effort to reach an agreement. With the impact of the shutdown becoming increasingly painful, lawmakers say they're willing to compromise on border security and immigration policy.